“Dividing Marks” is the new single from Leeds quartet Esper Scout, out now on Clue Club/Bomb The Twist. It’s full-blooded and predatory, dialing back from the raucous “In Foreign” to convey something altogether more foreboding, while joining “Gaps In The Border Fence” as a welcome addition to a growing catalog. Along with last spring’s “Compass,” it bodes well for their forthcoming debut album, due out in 2018. A collaboration with Leeds illustrator Tommings yields a video for “Dividing Marks” that transcends our abhorrence of unsubtle lyric clips by subverting key phrases, (“Threads of proof weave a fabric of truth…”), into the concept and giving the mini-film a life of its own. 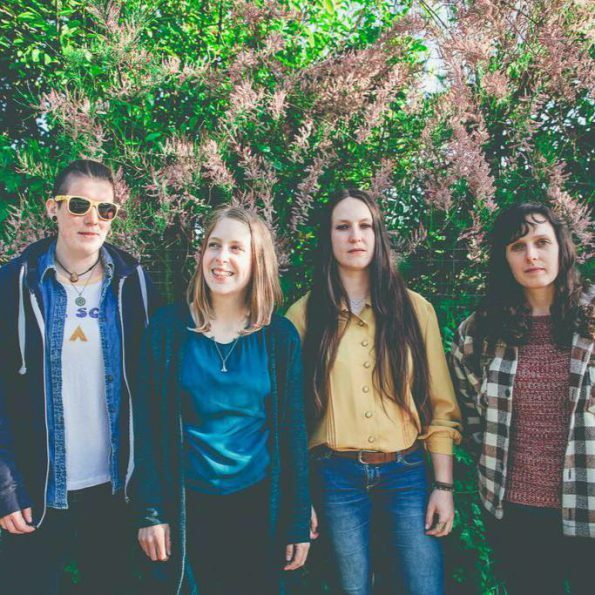 Born of a thriving UK DIY scene, Esper Scout, (Kirsty, Rebecca, Sarah, & Abbi), has been building momentum for the last few years. With one tour stateside already under their belts, (as immortalized in the video for their cover of Gang Of Four’s “At Home He Feels Like A Tourist”), we look forward to welcoming them back. In the meantime, luck falls to UK Owls, with your big chance to catch them coming up on December 21st at the Brudenell Social Club in Leeds, as they open up one night of the Cribs festive residency.